Though the nation is officially four years into economic recovery, a new Pew Research Center analysis of recently released Census data suggests that most Millennials (adults ages 18 to 32) are still not setting out on their own. 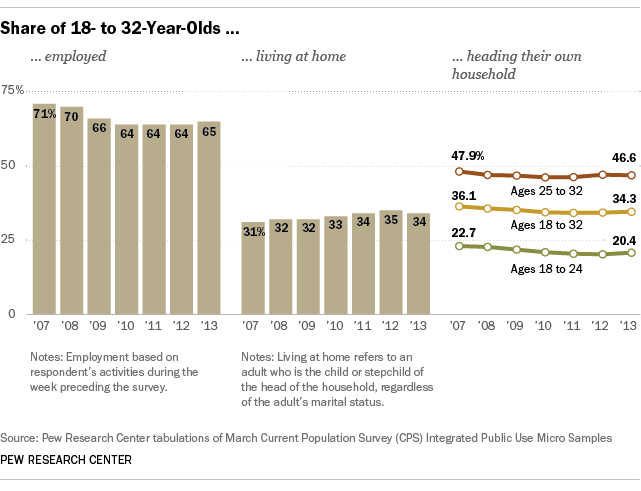 As of March 2013, only about one-in-three Millennials (34%) headed up their own household. This rate is unchanged from March 2012 and even lower than the level observed in the depths of the Great Recession ( in 2009, 35% of 18- to 32-year-olds headed their own households). The absence of any increase in household formation among Millennials is significant because it contributes to lackluster apartment and housing demand as well as the demand for household furnishings that goes along with independent living. What are Millennials doing if they’re not setting up their own households? In 2013, 34% of Millennials lived in their parents’ home, a decline from the 35% of 18- to 32-year-olds living at home in 2012. This marginal decline in living at home is largely a result of the way the Census data source handles young college students. In the Current Population Survey, unmarried 18- to 24-year-olds living in college dormitories are categorized as if they reside in their parent’s home. As the Census Bureau reported, college enrollment among 18- to 24-year-olds has declined from its peak in 2011, resulting in fewer Millennials living in college dormitories and being counted as living at home. Similarly, when we look at older Millennials – those ages 25 to 32 – we also see little change in the share who are living at home. In 2013, 15% of Millennials in this older age segment were living in their parents’ home, the same rate observed in this age group in 2012. And among 18- to 24-year-olds not enrolled in college, 50% lived with their mom and/or dad in 2013. Again, this is unchanged from the 50% observed in 2012. One of the contributing factors influencing household formation among young adults is the vigor of the job market. Millennials with jobs are substantially more likely to establish independent households than Millennials lacking jobs. In 2013, 40% of employed Millennials were the head of their own households, in comparison to 25% of Millennials who were not employed. Although job holding among young adults increased from 2012 (64%) to 2013 (65%), it remains below 2009 levels (66%) and far below pre-recession levels. In 2007, before the recession began, 71% of 18- to 32-year-olds were employed.